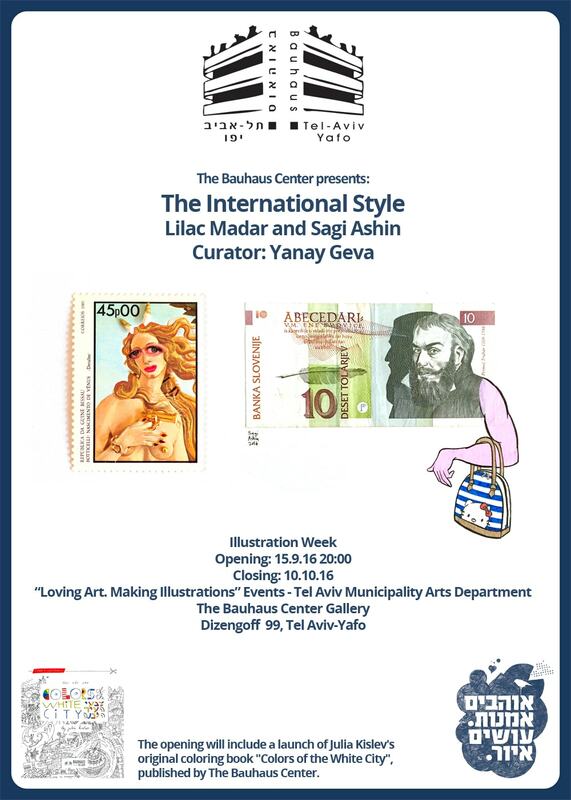 Lilac Madar and Sagi Asin joint exhibit: Tiny collages on stamps (including Bauhaus stamp series) and paintings on banknotes (including German Mark bills with Bauhaus designs). Both artists, graduates of the Bezalel Academy of Arts, base their work on ready-made substrates, and employ humor to deconstruct gender representations and shake off the conventions from these official state documents. The opening will include a launch of Julia Kislev‘s original coloring book “Colors of the White City”, published by The Bauhaus Center. 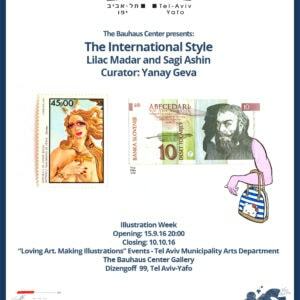 Sagi Ashin, illustrator and master printer, graduate of Hebrew University of Jerusalem’s Animal Sciences Faculty and Bezalel Academy of the Arts’ Department of Visual Communications, and founding member of the “Ba’alei HaMelacha” print workshop. Among other mediums, Sagi works with old photo albums to create imaginary histories for their subjects through illustration, collage, and prints. Lilac Madar, photographer and collagist, graduate of the Bezalel Academy of the Arts’ Department of Photography and Tel Aviv University’s Department of Art History. Lilac’s works focus mainly on aspects of gender through de- and re-construction of common media representations such as close-ups of sexual acts, grotesque monsters cut from fragments of fashion magazines, collages done on old black-and-white photos, and the stamps series: miniature collages on actual stamps, framed in round magnifying glasses which become peepholes. The booklet includes 12 original line drawings, each providing a different viewpoint of Tel Aviv.